A.M.K. aka Alang, Madan and Kulang. 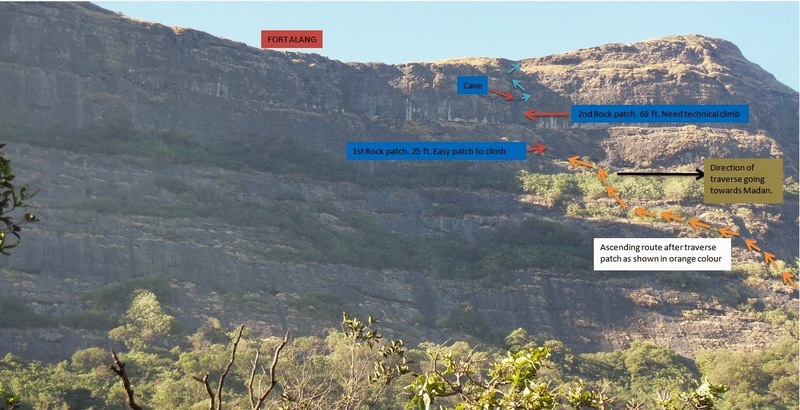 The three terrific forts in the Sahyadri range. These forts are famous for its rugged surrounding, rock patches requiring technical climbing, confusing routes having exposure to deep valley and most important; testing once endurance and stamina. I was waiting since many days to trek these forts. But the main problem was unfamiliarity with rock climbing, rope management techniques. So I had no option but to go with a trek group. One Mumbai based group planned their AMK trek on 13th to 15th Dec.2013. I immediately enrolled with them accompanied by Mahadeo and Amit. Packing bag with essential things like sleeping mat, torch, eatables, water bottles, energy drinks, extra clothes; Mahadeo and I headed towards Mumbai by train from Pune, on 12th Dec. evening. The plan was to reach Kasara by last local. We reached to Kalyan @ 10.30PM and Kasara @ 12.15 AM by Express train. The group expected to come by 3.00AM. So we slept on the platform in the chilling cold. But it was essential sleep. @3.15AM local train arrived on station and all the group members headed towards Ambegaon (before that we shared the cooking ration load among the team) by private vehicles. There are three routes to approach these forts; from Ambewadi or from Kulangwadi or from Ghatghar. The trek route is interconnected to these forts. You can either start your trek by ascending Fort Kulang through Kulangwadi and the route continues till Alang or start from Fort Alang through Ambewadi/Ghatghar and the route continues till Kulang. 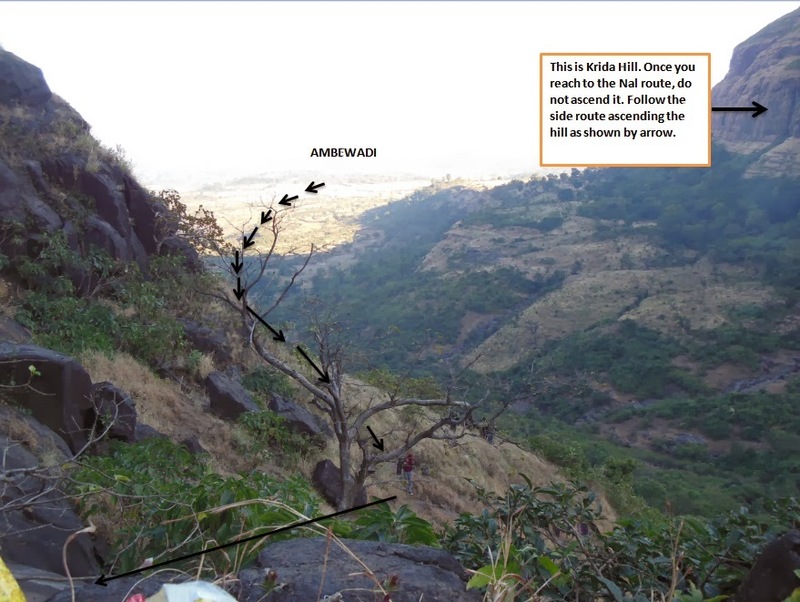 We did this trek from Ambegaon. Upon reaching Ambewadi, we halted at Lakhan’s house. He usually provides the guide to all the trek groups. We had breakfast there and @ 7am we left for the Fort Alang. It was very pleasant environment around the village with massive hills surrounding it. Trek route follows through the village then towards Krida hill (I heard this name from our guide itself. We need to climb a small hill followed by traverse patch and then ascending small distance to reach first rock patch of Alang. This route passes through dense jungle. At some points, there might be chances of missing the route. So if you are new to the forts, it is advisable to ask for guide. I have tried to show the route in the map given below. There were two caves near to the first rock patch. One cave having water pond. It was better drinking water than available on the Fort Alang. Also do carry water purification tablet with you. 3-4 team members from the group arrived early near the rock patch. I was over adventurous to see the infamous rock patch of Alang. So at the first rock patch, I started climbing it with sack on the back. After reaching about 75% of the height, at one moment I lost the grip both with the hand and the leg and suddenly I fell down on the ground. It was almost 10-15 ft. height. My left ankle got twisted and bum was numbJ. It was lucky escape as there was deep valley adjacent to the rock patch. I miraculously lived with minimum injury due to my sack. Otherwise my back would have well shaken. God’s Grace!!!! I sat there for longer period to recover from the jolt. Our guide, Kailas free climbed the patch (It is actually easy patch with enough grips. My only fault was rush to climb it.) & tied rope for other participants. One by one we started climbing it, taking support of the rope. Our bags also pulled with the help of rope. 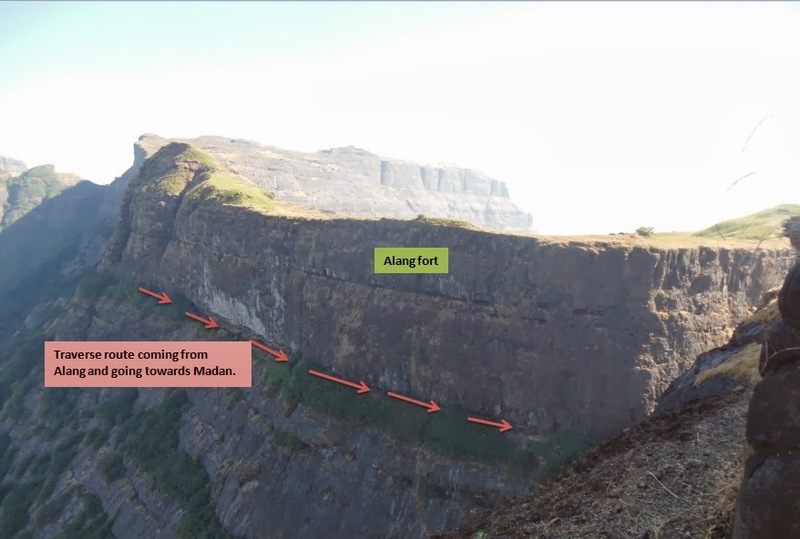 And the next phase was the notorious 70 ft. rock patch of Alang. Our lead climber was Kailas, the 19 year old boy from the Ambewadi. He free climbed that patch with such an ease that we admired this skills with spontaneous round of claps. He setup the rope and one by one we started the climb. We hardly climbed the patch. All of the team members were literally pulled by the people sitting on the top. It was time taking activity. It took around 5PM to pull the entire team members on the fort. The patch is challenging due to less grips to hold. As all the team was novice in climbing, we horrified with the way we pulled by the guys standing on the top of the climbing wallJ. There was small cave next to the top of rock patch. There were steps to reach top of the fort having 100% exposure to deep valley. You need to be careful to ascend and descend these steps. 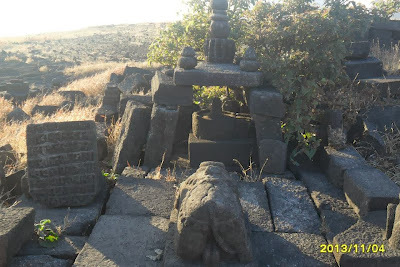 Entrance structure of Fort Alang was totally destroyed. Once we reached to the machi area, we were amazed to see the expanse of the fort and the chiseled walls of the hill on which this fort, standing since many years. The shape of the Alang fort is similar to U shape. When you enter the fort, broken temple of Lord Shiva will welcome you. There are 6-7 small water tanks on the machi area. You can see the two caves on the fort. One cave is not good for stay. Another cave is spacious and good option for stay on the fort. It can accommodate 30-40 trekkers. There is small tank adjacent to this cave. The water is not potable. To the west side of fort, you can see Fort Madan and Kulang. 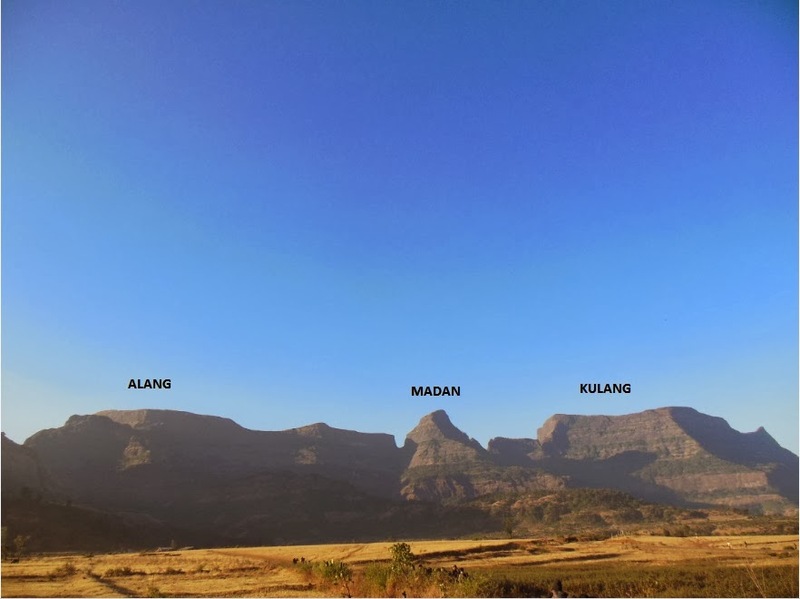 The view of Madan is amazing from the far west end of Alang fort. Steps of Madan fort can be visible from this point. We put-off our sack in the cave and walked outside to explore the fort. We climbed the fort till highest point of the fort on east side. There is 11 water tanks constructed side by side. Many ruined structures can be seen on this plateau. You can view monstrous hills of Krida and Srikrida from this point. There is one more cave at the top most portion of fort, full of water. In front of the cave, there is Stoney column erected. 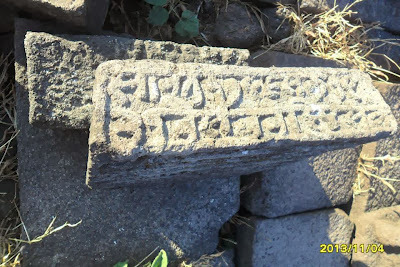 There are some transcripts inscribed on piece of rocks laying unattended (Sorry state of every historical structure). We waited there to see the sunset. Amazing view!! With content mind, we returned to the cave. Organizers had already started cooking for the dinner. Due to time mis-management, we had our dinner @10.30PM. This trek was so adventurous and challenging that we avoided to show up our irritation with the group’s management. It was trek-members with whom we mingled with ease. Though there was shivering cold outside, Cave was warm. We had sound sleep. In the morning, first rays of sun directly showered on the peak of Madan and Kulang. The scenario is really mesmerizing and photogenic! We started descending Alang fort after completing morning rituals. Rappelling was easy task to do. One by one we rappelled down by pulley. Ideally rappel set-up consists of descender; with the help of which we can go downward smoothly. Our guide did not aware of this set-up. He directly pushed all the trek-mates through this Alang wall using pulley set-up. Very uncomfortable!! Route to Madan is traverse patch till the steps of Madan. You need not have to descend down from the Alang. The route to Madan fort goes exactly in the opposite direction to that of rock patches of Alang. We started walking towards Fort Madan without waiting our guide Kailas. The route is quite simple, without any chances of losing it. We reached to col between Alang and Madan. 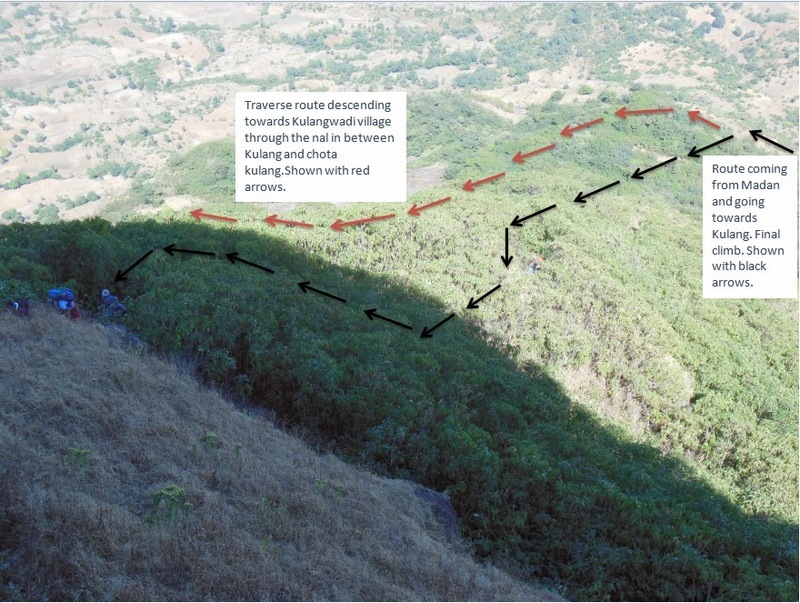 Follow the traverse route going in the direction of Madan. From this col, one route descending through Nal goes to the Kulang. Do not descend down at this khind. Just continue to follow traverse path. Within 8-10 minutes, we reached to steps of Madan. We climbed the steps and waited for the rest of the team to come, at flat rocky platform. We had little breakfast there and waited for Kailas. There is traverse till small distance and you will reach to rock patch of Madan. At one point of traverse, there is full exposure to deep valley. Though there are grips to cross it safely, it is advisable to set up rope for it. It’s better to be safe than sorry! Kailas free climbed the rock patch of Madan and set up rope for other participants. 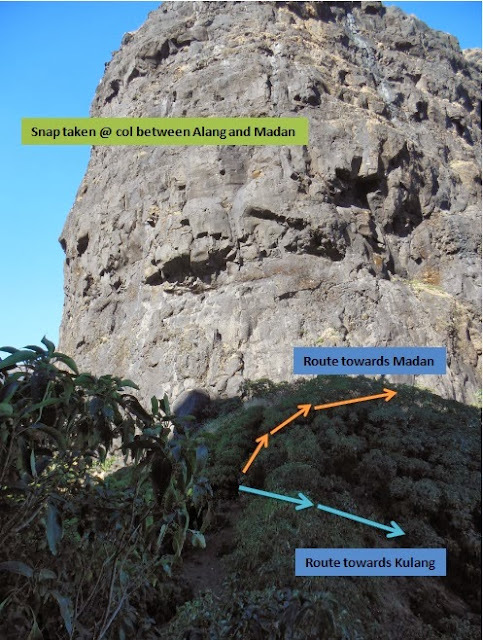 Rock patch of Madan is easier than Alang but still required technical climbing. Rock patch has 100% exposure to gorge. It is having enough grips to hold so you can actually enjoy the rock climbing thrill!! Once you climb this patch, there is another traverse patch with little bit scree on the ground. View of Alang fort is terrific from this traverse. You can also enjoy ‘Echo’ reflecting from the wall of Alang. At the ending of this traverse, final steps to Madan forts start. Area of Madan fort is much smaller. Nothing is left on the fort except, two water tanks and a cave. Cave can accommodate 20-30 people. Water is potable from the tanks. We had Maggi session followed by rest and then waited for the sunset view. Dinner was served with Khichadi, papad and pickle. We have successfully climbed the two of most difficult treks in Sahyadri. Next day was last expedition of Kulang. 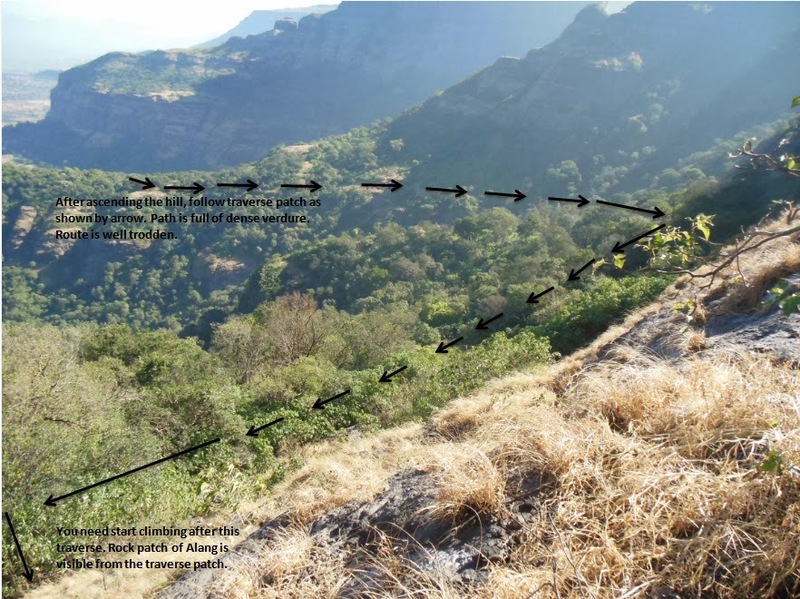 Kulang trek boasts to be highest climb from the base in Sahyadri range. Next morning, we hurriedly descended the Madan. It took around 4 hrs to reach top of Kulang from the Madan. Most of the route is traversing patch and final track is steep. We waited at the Khind for Kailas to lead the route. While waiting there, we greeted with another group from Mumbai. They had hired guide from Samrad village named Datta Bhangre. He was very friendly person and gave us his contact card. 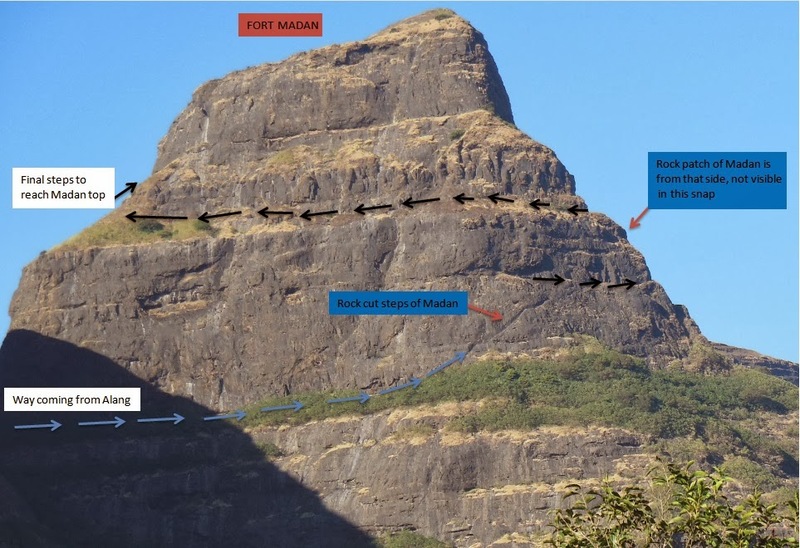 He usually helps trekkers to arrange technical climbing, rappelling and food on the forts like AMK, Sandhan valley, Kalsubai etc. You can directly contact him and arrange the trek around this area with minimum money. He has all the equipment required for technical ascend and descend. If you need his contact number, just post me about it. After waiting for 20 minutes, Kailas arrived and we started our journey towards Kulang. 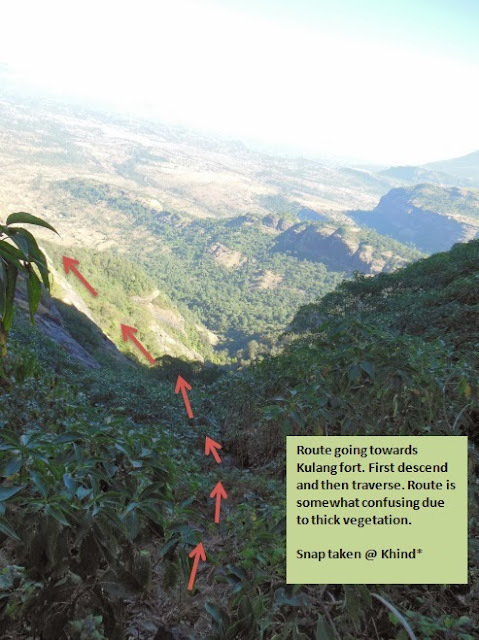 From the col, you need to descend a Nal (Ambewadi side) till some distance and follow the traverse route. This route is well trodden except some points. Look for the signs set up by local people. One of the most prominent is stones stacking up on one another. The route mostly passes through dense shrubs and Karvi. There were water streams enroute. We filled our bottles and headed towards the fort. You can clearly view ‘Nedhe’ of Madan from this route. It took 2.5 hrs. to reach a point where you need to start ascend for Kulang. At this junction, if you continues to follow straight route it will descends down to Kulangwadi through a Nalicha route (Nal in between Kulang fort and Chota Kulang hill). We started ascending steep hill. This patch was exhausting. At the last patch, you will see rock cut steps to enter the Kulang. Route identification mark setup by local villagers! very useful for trekkers! One by one we climbed the fort and reached atop. To our surprise, we had received warm welcome from the group of 7-8 friends from the village Nandgaon Bk, Igatpuri. They had cooked Chicken and rice. They offered us the meal. It was big surprise for us. We were around 14 people who reached on the fort early. All of us dine with utmost satisfaction. Thanks to the Gang of Nandgaon. God bless them!!! After heavy lunch, we wandered on the fort. It is again a massive fort. Numerous water tank on fort. A cave to stay. Remnants of fortification. View of Chota Kulang is amazing from the far end of Kulang. Some of our team enjoyed swimming in one of the water tank. We had successfully completed the marathon trek. As we started descending the fort, our Trek leaders arrived on the fort. It was already 4.30PM in the clock. Our guide left the group after reaching Kulang base. Trek leaders went after exploring the fort and we started descending it. After 30 minutes we reached to the base, where we started climbing the Kulang fort. Nobody had the idea about route to descend down to Kulangwadi. We explored some of the route but failed. Time was running out of our hand. We called Datta Bhangre ( the guide from Samrad). He gave us detailed information about the route. We thanked him for much needed generous help and started walking towards the Nal in between Kulang and Chota Kulang. Once you reach to this Nal. Start descending it. Route is well trodden. It was getting darker. We hurriedly descended the Nal. After complete descend, there is a temple. Follow the same route. You will reach to small wadi of 4-5 huts. We asked villagers about the main tar road which going towards Ambewadi. Our private vehicles waited at nearby village. We called them and confirmed their location. We had to again walk till some distance on tar road. It was pitch dark with only moonlight spread over the entire region. After 10-15 minutes, we reached to our vehicles. After few dramatic instances about the group’s mismanagement, we finally headed towards Kasara. We had 9.25PM local to reach Kalyan. Within time we reached to Kasara then to Kalyan and then to Pune by Express train. 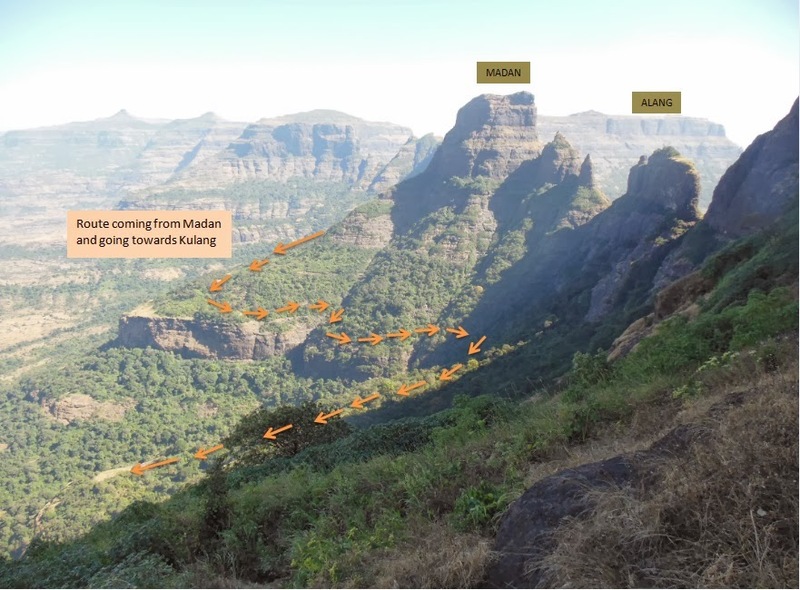 AMK trek is certainly one of the challenging trek in Sahyadri. Even if you are novice in climbing, still you can manage this trek on your own. Just the task is to reach Ambewadi or Samrad. There are few skilled climbers from the village who usually arrange for technical help, cooking and other required thing. If you have prior experience of trekking then you should directly try to manage these treks with the help of local people. I have contact number of one of such guide. Overall it was satisfying experience to climb these three forts!!!! Worth doing it!! !